The Hammond organ and the vibraphone are arguably the two warmest and most viscerally satisfying instruments ever played in a Jazz context (or any context, for that matter). It is disappointing, but perhaps not so surprising, that so little documentation exists of the two playing together. Most famous perhaps are guitarist Grant Green’s 1964 Blue Note recording Street of Dreams, featuring Bobby Hutcherson and Larry Young (with Elvin Jones) and organist John Patton’s Let ’Em Roll (1965), also on Blue Note and featuring Bobby Hutcherson (along with Grant Green and Otis “Candy” Finch). Other such recorded collaborations include: Lionel Hampton & Milt Buckner, Gary Burton & Larry Goldings, Joe Locke & Barbara Dennerlein, Steve Nelson & Mike LeDonne, Vid Jamnik & Rob Bargad (if I may...), Warren Wolf & Jake Sherman (with saxophonist Mike Tucker), Stefon Harris & Jared Gold (with guitarist Dave Stryker) and at least two fine projects featuring Bobby Hutcherson & Joey DeFrancesco. The great organist Eddie Louiss has recorded in duo with piano (Michel Petrucciani) and with accordion (Richard Galliano), but the duo of Hammond and vibes (at least to my knowledge), has never been recorded – until now. This elegant CD presents two highly accomplished individuals - musically at the top of their game. 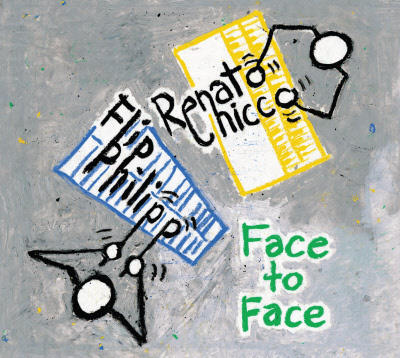 Renato Chicco has played with some of the world’s greatest Jazz artists, including Jon Hendricks, Clark Terry and Jerry Bergonzi. Flip Philipp is principal percussionist with the Vienna Symphony and has shared the stage with such Jazz greats as Joe Zawinul, Idris Muhammad and Walt Weiskopf. Both are also highly valued and respected teachers of music. The Hammond and the vibes actually emit very similar tonal ranges, textures, and tamburs. While the mechanics of each instrument are completely different, at the heart of both lie devices if not of similar function, then at least of similar shape and concept: the rotating tonewheels that create the actual sound of the Hammond, and the rotating discs controlling the vibrato speed of the vibraphone. Both can also be played dry (without vibrato – and just to be clear, the Hammond’s vibrato is not controlled by the tonewheels, but by various independent vibrato settings). But these related attributes make a successful duo performance an even greater challenge. As with piano and guitar – the two are chordal instruments with both accompaniment and solo capabilities. The tendency could easily be to overplay and crowd the music. But in this case, you have two extremely mature, sensitive and highly creative musicians whose collective wealth of musical knowledge and experience is succesfully and delightfully brought to life here, within this unique and demanding setting.